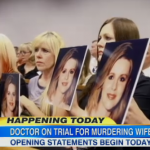 Dan appeared on Good Morning America today alongside Nancy Grace to discuss the case of Martin MacNeill, a physician and former Sunday school teacher in Utah, accused of giving his wife a deadly dose of painkillers in 2007. MacNeill, 57, was having an affair with another woman, according to court documents, and allegedly devised a plan to kill his wife, Michelle, 50, in order to continue the affair. Dan explains, “This is a bad guy; I don’t think there’s any question about it. The question is how much of him being a bad guy is going to be in front of this jury. Some of it the judges already excluded from evidence. But I think Nancy’s right is going to be this key to the defense here is maybe she wasn’t murdered at all. I don’t think this alibi is going to hold up… the question is going to be can they prove beyond a reasonable doubt that there was a murder at all.” Find out what both Dan and Nancy think will happen here.